Smell plays a significant role in how we react physically, mentally, and emotionally to the world around us, so it's no wonder that pure essential oils can affect our physiological, psychological, and spiritual health. Essential oils are aromatic, highly concentrated oils that are extracted directly from various parts of different plants. Aromatherapy uses these oils to enhance well-being. The inhalation of certain essential oils is associated with the release of brain chemicals that stimulate various emotions. Research finds links between scents and behavior, and aroma can influence the biochemistry of the nervous system -- one Japanese study finds that certain oils stimulate the sympathetic nervous system (which modulates heart rate, blood vessel constriction, and blood pressure), while others calm it. Essential oils tend to work synergistically, so using a combination of oils often creates a more powerful effect than an individual oil. Here are a few of the most common oils. Lavender is associated with improved sleep and relaxation, easing depression, and alleviating symptoms of PMS. Lemon is an uplifting scent linked to an improved mood and may help relieve depression and anxiety. Eucalyptus has been found to reduce congestion and head pressure in people with sinusitis. Rosemary is linked to improved concentration, speed, and accuracy during mental tasks, and it may also help boost memory. Peppermint may soothe headaches and act as a mental stimulant. Research links peppermint oil to better energy and performance. Essential oils can be heated in a diffuser, added to bathwater, mixed with water in a spray bottle, or even applied to a cotton ball and placed in the air vents of your car. 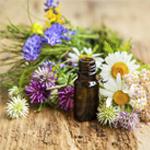 Some essential oils have anti-inflammatory and analgesic effects when applied topically, and they can be potent, healing additions to skin care products. A few drops of essential oil can also be added to a carrier oil like almond, apricot, olive, or jojoba oil and massaged into the skin and muscles. When choosing essential oils, quality is crucial -- be sure to select oils that are 100 percent pure botanical extracts, not chemical reproductions of fragrances.